Those are my kids’ hands in the pictures as they couldn’t wait to dig in! I have loved this dip for many years and so have they. It is such a crowd pleaser, everyone devours it. I recently discovered how to sneak some healthiness in the dip, disguised as sour cream 😉 If you are a fan of my blog you know I am a big advocate of food source probiotics and the health benefits that accompany them. Instead of using traditional sour cream, I make my own sour cream from milk kefir. 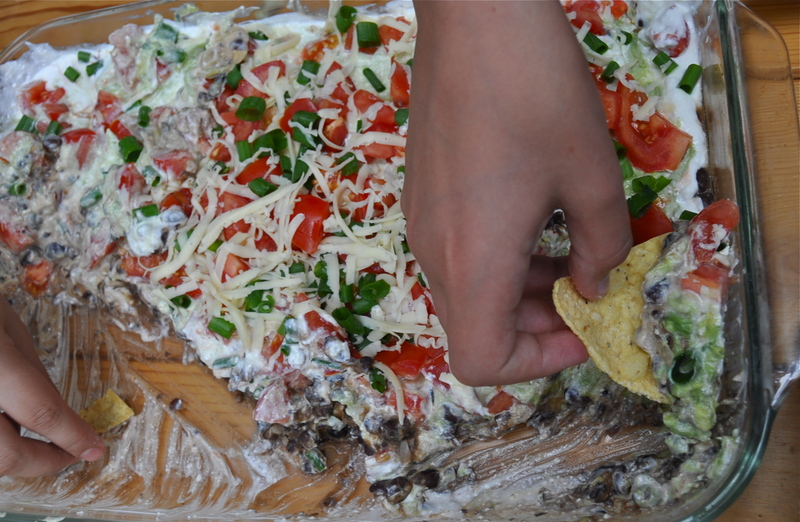 If you are planning on doing this, you will need to start your sour cream 1-2 days in advance (jump to recipe for more information). If you are unable to make or source kefir you can substitute with regular sour cream, strained greek yogurt, or vegan sour cream. The rest of the recipe consists of fibre rich beans, heart healthy avocados, and fresh vegetables. 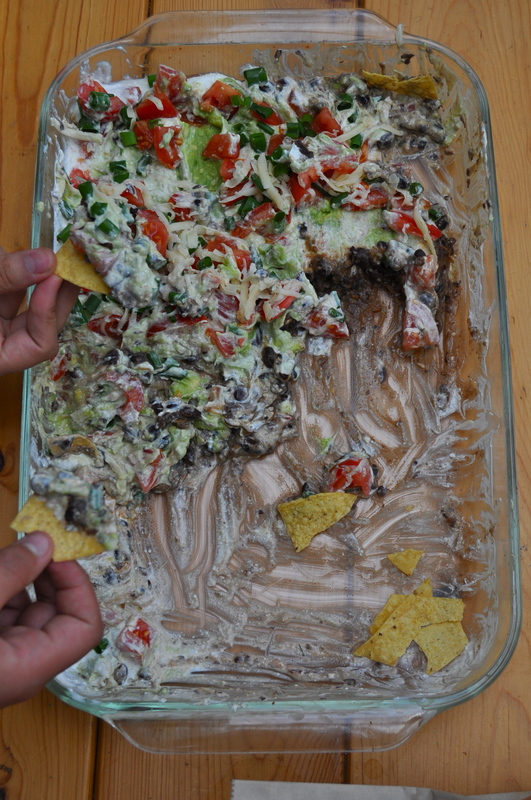 Served with organic tortilla chips this dip is so luscious you won’t believe it is healthy. Place it at the centre of the table and watch how fast it disappears. I love it and know you will too. Although there are a few steps involved, they take hardly any time. You can cheat and used canned beans and guacamole, but it is so simple to make the homemade versions and the flavour is much fresher. Strain kefir in a nut milk bag or over a colander lined with cheesecloth for a few hours to thicken. Place a bowl underneath the nut milk bag or colander to catch the whey. Reserve the whey for other uses. 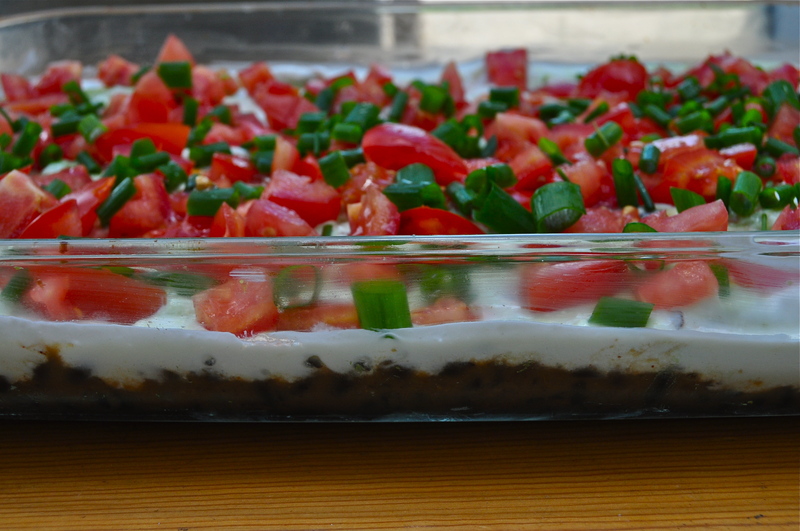 This entry was posted in snack, vegetarian and tagged 7 layer dip, dip, fresh, healthy 7 layer dip, healthy mexican, healthy taco dip, kefir sour cream, mexican recipe, recipe, taco dip. Bookmark the permalink. This is a super dip! Love it! And I’m laughing because the only way I can get fermented foods into my kids is brine into Mexican salsa — lately I’ve been pureeing sauerkraut into it and that works too. Same kids who totally scrunch noses to all oit. Viva Mexican food! That is such a great idea!! Thanks for sharing!